vClarus from Bell integration is an end-to-end platform designed to ensure your workload migration runs as smoothly as possible, minimising any risks, over-spend and disruption to your business. So, if you’ve been putting off cloud adoption or data consolidation and missing out on the benefits, vClarus is the solution. Workload migration, whether for cloud adoption, data centre consolidation or driven by corporate M&A is often approached with trepidation with its inherent risks being the number one concern for businesses. With more than 50% of data migration projects predicted to exceed budget and result in business disruption in 2019, the fear is justified. The problem is that traditional spreadsheet and project planning methods can be cumbersome, error prone, disruptive and high cost. There’s a lack of understanding of current systems and of requirements which in turn leads to a flawed execution. It’s these risks and knowledge gaps that are stopping businesses from migrating and reaping the benefits. Businesses need an end-to-end solution that makes the workload migration process as smooth as possible, without unplanned downtime, data loss or otherwise negatively impacting the day-to-day operations. vClarus, Bell Integration’s end-to-end data migration platform, allows for a single point of truth for all data relating to the migration to be stored, lowering the risk and improving consistency and productivity. The discovery phase is critical to the success of the migration. 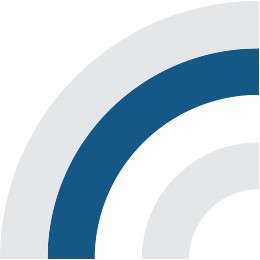 Using the most relevant discovery techniques including your in-house reporting tools, existing documents, a fully online web-based questionnaire and workshop process, we analyse your current estate – from services through to applications and infrastructure. From this analysis, vClarus produces a Strategic Service Mapping, showing the end-to-end hierarchy for each service, which is navigable and real time. Probably for the first time, you’ll have a fully documented graphical representation of your services, applications and infrastructure which is crucial for a successful migration and invaluable for ongoing support. Migration Principles, which will vary between parts of the business and applications / infrastructure define what the end results will be. From here we formulate the Migration Approaches which is the method used to establish each Migration Principle. 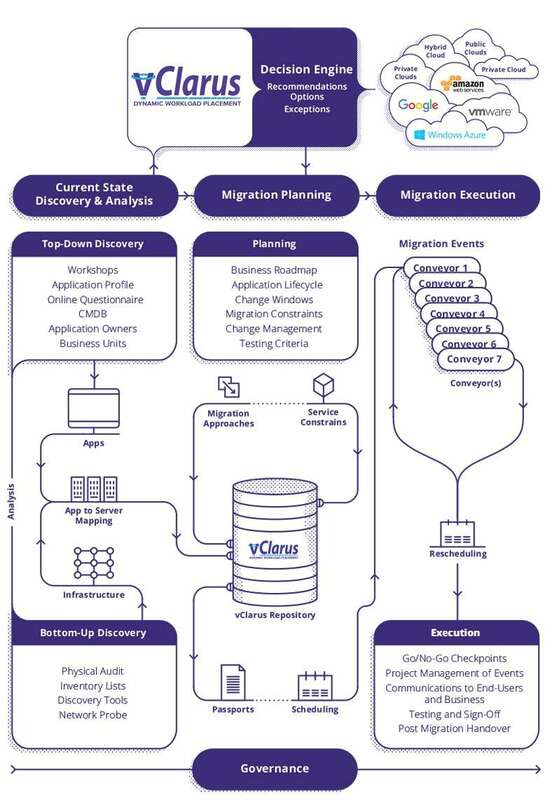 For each Migration Approach, a Migration Passport is built in vClarus; detailed task by task descriptions of how to perform each approach. These are templates to be used for the migrations themselves with each passport containing the tasks, owners, date and migration entity type. Next a Migration Schedule is constructed using Conveyors. A Conveyer is a move group, with the one thing in common for the migration items being a shared cutover date. The Conveyor takes into consideration the application relationships, the most suitable Migration Passport, business constraints such as blackout windows and peak activity, all with the aim of de-risking and minimising disruption during the migrations. vClarus auto generates all migration tasks, potentially removing hundreds of hours of manual planning effort. For example, if you have 50 tasks in a passport and a set of conveyors containing 1000 servers, vClarus will auto generate 50,000 migration tasks, along with the specific date each task needs to be performed. Finally, we perform all your workload migrations, tracked using the RAG dashboards which provide transparent progress reporting. Crucially we maintain a dynamic planning and replanning capability. Any rescheduling that’s needed due to external factors, can be simply done through planning screens, by the project management with point and click and all tasks are automatically regenerated and tracked. Bell’s uses vClarus a proprietary and exclusive governance toolset and methodology; developed over 12 years of successful migration programmes.